A few samples have been attached to this post to give you an idea of how they appear and how to work with them. Changing the Genesis palettes within TM can be a bit dicky and inaccurate especially if you are attempting to change an entire palette of 16 etc. Personally, I prefer to enter my palettes directly with a hex editor after determining my palette by using NOSE's color sniper utility, or building it manually with the color gradient square. More advanced stuff (like the optimized importing of title screen backgrounds etc.) may follow in the hopefully not-to-distant future. Nice job wboy! We should make a reference file for tile molester with all the palettes and bookmarks, that should be great! I considered just doing exactly that (the TM reference xml containg all relevant bookmarks), but then thought would then get lazy and not bother to learn how to use TM's shortcut features. That and the fact its pretty easy for one to bookmark the offsets and palettes themselves. How to you edited screens and graphics with TM? I tried paste jpg files from the internet and it messes up the rom. So how do you editing the screens. I am now working a rom called NCAA Hockey 2007 and of course have the rosters and uniforms straight thanks to you NOSE NHL 94 editor. thanks wboy, that is just great. You said sometime ago you wanted to hack NHLPA 93, is that in the works, and if it is how is it coming. And which version is your personal favorite? Each tile is 8x8 pixels. 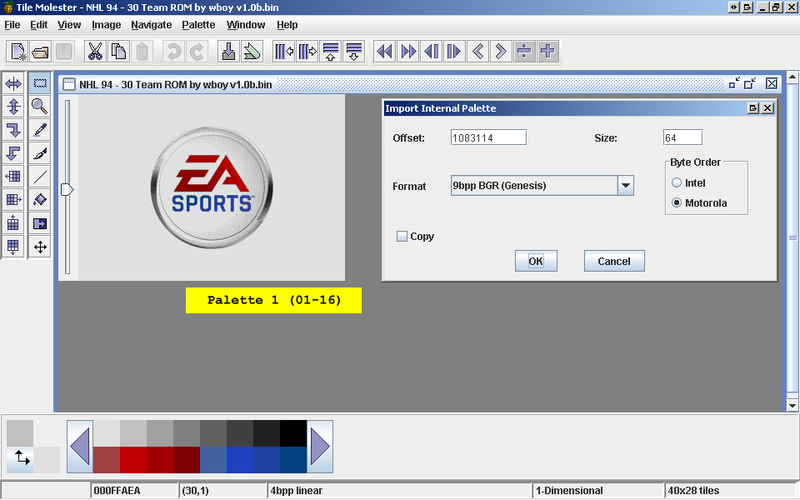 As an example if you take the EA Sports screen it is 40 x 28 tiles, meaning its is 40x8 = 320 x 28x8 = 224 pixels. When you import a graphic file into TM, make sure you import a image that matches the pixel dimensions (e.g 320x224 as calculated in the example above). Failing to do so can mean when you insert a bigger graphic than expected it can overwrite other required/import bytes that may result in game crashes or odd looking graphics. This means you will have to resize down (and possible crop) the image you sourced from the internet down to the appropriate size using your favorite graphics editing program, save it as a BMP of PNG (I don't recommend JPG as it can add unwanted artifacts), and then insert it into TM. Not so much "you" as in I, more so "mack" wants me too. Wouldn't be doing it for the disrespectful likes of 77 etc, thats for sure! is that in the works, and if it is how is it coming. slowly, but I had a break thru the other night learning how to perminantly disable fighting. I don't believe in fighting. EA Hockey & 94 (with the Hyperspeed hack) a honourable alternative. Favorite Way To Score:punch your mother in the face! you've only got yourself to blame... nice to know I achieved the desired result. Well *apparently* I've been able to hack a season mode in which you'll find more interesting! Well, because on every 28 day cycle within the season you'll be skating around while bleeding all over the rink you biatch! Yes... This is quite an old topic and have no idea if wboy's even "alive" anymore, but if he happens to be here anymore, could he tell me the offsets of the team logos in the ice and the menu screen. 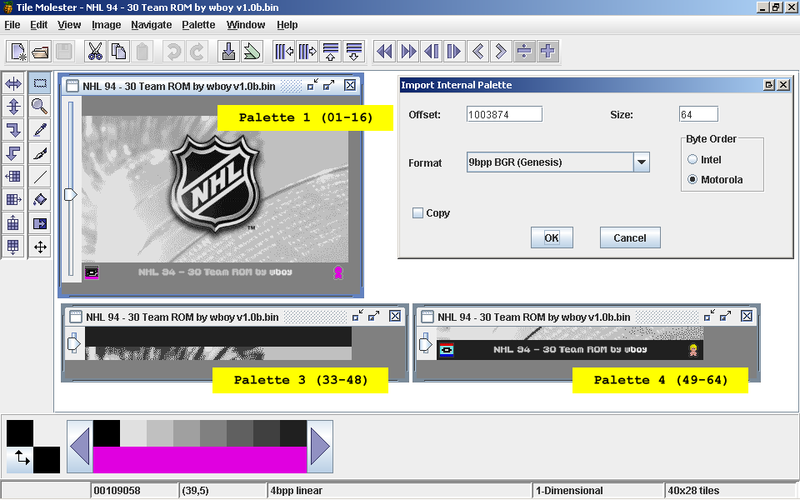 Centre-ice logos are shown in picture 17 in the file in wboy's post. Hopefully they are the same as the menu screen logos. The first one is at offset 1D6F02. Use Tile Molester 0.16 ( http://www.romhacking.net/utils/109/). The menu screen logos are picture 15. Note that the palette size is set to 480. you need to hit the big right arrow next to the palette each time you advance to the next logo, to get the right colours. Unfortunately, there is no indication of where the successive palettes are for the centre ice logos.. anyone know where they are? 2. Go to Options > Offset > Decimal. 3. Click the S for Strips. 4. Look at the number above your player wearing the home uniform. This is number is the color palette for that teams uniform. They change with every team, obviously. Make sure you change to that color palette before you try editing the logo for that team. If you do anything to the logo before you change the color, you will screw up that logo and possibly more. I've ruined multiple roms by doing that and failing to save previous versions. I don't make that mistake anymore, haha. Favorite Way To Score:Hitting the goalie. Poor goalie. My problem is that I can't change the palette. I'm trying to replace Phoenix with Winnipeg and can't get the palette to change to the blues and reds I have for Winnipeg's jerseys. The jerseys display fine but I cannot change the palette for the ice-logo or the team selection logo. Really good screenshots, thanks for sharing! But what if I want to do this on the original ROM? Or, Original ROM (after the checksum fix). Does anyone have the address for the "select teams" logos, splash screens and such for original ROM (good gen v3)? you won't be able to find those, or at least edit those...well you could i suppose, but it wouldn't be worth the huge amount of time. it has to do with the compression of those graphics in the rom. I think there were lots of games over 1MB, so it should be fine. There are some ROMs in the downloads section. Is there some kind of "perfect starting ROM" that stores "Select Team"-logos, splash screens and ice logos in an easy editable manner, preferrably with bookmark references for tile molester, including palette bookmarks. I like your idea for "perfect starting ROM" with the tile molester bookmarks. The 2MB ROMs have all the main graphics decompressed, which is why you can wysiwyg edit them. someone should create a nice ROM editing package with all the bookmarks some time..
as it is currently, i think these screenshots are the best resource we have. i've long considered doing this because i always had trouble remembering the exact location of everything and having the palettes right there would be so easy. can't believe i never have, but glad you are. will be nice. However, the net already looks amazing in the 30 team wboy 1.0b rom. "2. Palette> Import From> This File> Offset: 366884> Size: 64> Byte Order: Motorola> Format: 9bpp BGR (Genesis). 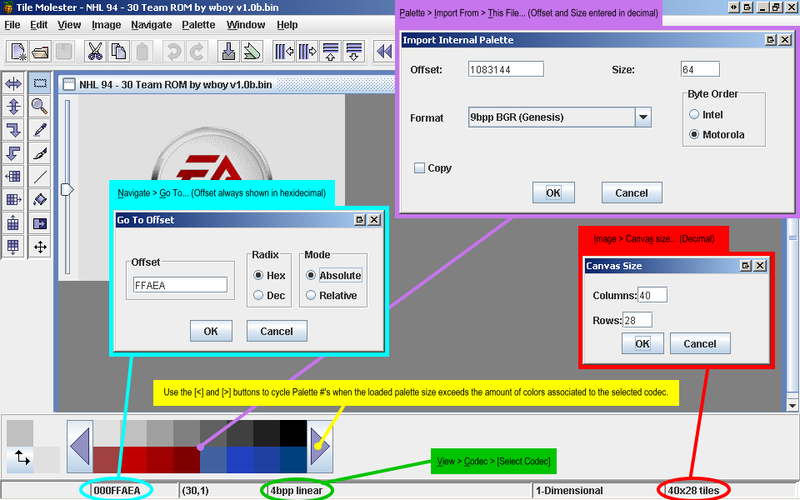 NOTE: cycle to the 2nd palette (arrow on the right) in the bottom tool bar after this palette is loaded." Here's a screengrab, at least it's on the way..
And how in the name of.. do you know which palette should be used for that star? #1: 0007C144 is the offset for the player star. Isn't the game a lot faster with this wboy 30 team rom? I mean the players seems to be crazy good compare to original game?